Ensure you look good and get great results from your photoshoot with our tried and tested tips. Photoshoots can be daunting. You can train hard in the gym and follow a clean nutritious diet plan, only to stumble at the last hurdle. How you handle the last few days before a shoot can make or break the final photos. Ensure you get mind-blowing results from your fitness or bodybuilding photoshoot with our tried & tested top tips. This guide will take you through your photoshoot preparation step by step to ensure you get the best out of your shoot by taking care of your grooming, photo shoot planning and diet. Follow these 10 steps to make sure you look as good as you can on the day! Before you even book a photoshoot, you need to get lean — this can’t be done overnight! Getting lean requires a well-thought-out plan that starts a few months beforehand. The aim is to strip off the body fat without eating into your hard-earned muscle. We’ve perfected this ‘dark art’ ourselves by experimentation and by training over 1000 clients online. 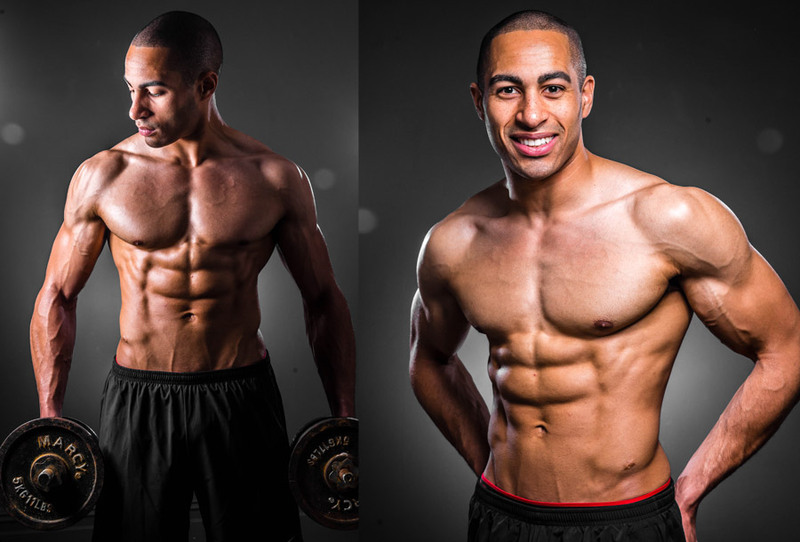 So if you’re not confident with getting lean for a fitness photoshoot, we’re here to help! You may not have noticed, but almost all fitness models are completely lacking in body hair. 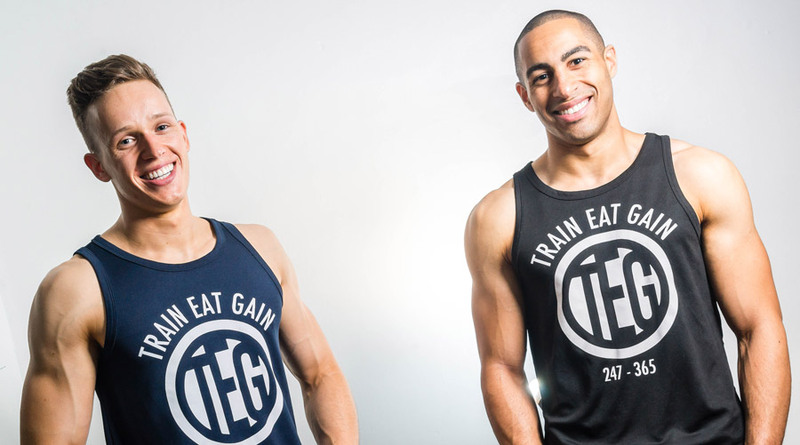 There’s no sexism here – both guys and girls look better hairless for a fitness shoot! Body hair can at best hide your muscle definition, but at worst can make you look dirty and will put people off. Shaving is the easiest option and you can do it yourself, although it will go stubbly fairly quickly so ideally do this the day before (not on the day to avoid any shaving marks or redness!). If wet shaving, use a good shaving oil and a post shave balm, to reduce irritation. Waxing is a better option for a longer-lasting effect, but is generally more expensive if done properly by a professional. Epilating can also work for leg and arm hair – girls, you should know what works best for you already! Guys, make sure your facial hair is neat and presentable. Clean-shaved is a good approachable look, although a beard may work for a more wild and savage appearance. Lazar Angelov has famously sported the world’s neatest stubble, so you can get away with a neat style like this too! Also make sure to trim other unsightly facial hair including nose hair, eyebrows and ear hair, if you have any. Whilst photoshop can sort out these areas, you will save a load of hassle and potentially money by reducing the amount of editing required. Being a fair-skinned British guy, I can say this without being prejudiced – having a tan makes you look better! A tan makes you look radiant and healthy, with the bonus of adding clarity and definition to your muscles. The camera washes you out and makes you look paler than usual, so go a shade darker than you think necessary. There are many different methods of tanning, but from experience a professional spray tan is by far and away the easiest, quickest and safest option. For just £15, you can get a very convincing natural-looking spray tan, which lasts for up to a week. For best results, get a spray tan the day before. Tanning naturally outdoors is great if you live somewhere sunny and you have the time, but getting an even tan is actually very difficult, and too much exposure to the sun is not healthy in the long run. In addition to a tan, a thin coat of baby oil or moisturiser can help make skin look radiant and enhance definition. Make sure you get a hair cut. If you’re a guy, shorter hair will make you look bigger and more muscular. Ensure you have a neat hairline and no gross neck hair! If you have short-medium length hair, use a good wax such as American Crew Fiber to style it and hold it in position. Girls, how you have your hair will determine whether you look glamorous, sporty or plain unkempt. You may not need a full haircut, but a trim & style can work wonders. Check out current fitness models for inspiration. Make sure you turn up at the shoot with clean hair, a clean face and a clean body! If your hair and skin are dirty and greasy it will show up in the photos and be plain unpleasant for everyone else involved. If makeup is being provided for the shoot, make sure you turn up makeup free. If not, then take care of your makeup yourself and get ready as if you were going out for the evening. Apply more than you would for daytime use – studio lighting will reduce the effect of any makeup you apply! Spots can be a nightmare. They can spring up on you at the last minute leaving angry red blotches that can ruin a photo. Avoid getting too sweaty in the few days running up to the photoshoot, try and stay as stress free as possible and keep your skin clean. If you are unlucky enough to get a spot at the last minute, try this tip that I’ve found to work wonders when you’re in a pinch. Get a couple of aspirin tablets and crush them up in a small bowl. Add a dash of water and mix into a paste. Use a cotton pad to apply this mixture onto the spot and the area around it and leave for 15 minutes. Wash off the paste and it should significantly reduce the redness and swelling. You can repeat this process a couple of times for maximum effect. This may seem obvious, but make sure your teeth are clean, especially if you have eaten beforehand. Food stuck in your teeth is really obvious and off-putting, and can be a pain to edit out afterwards. The phrase “Fail to prepare, prepare to fail” comes to mind here. Creating a full shot list can make a huge difference to the success of your photoshoot – especially if these are shots for you and not for the photographer. Create a shot list detailing every photo you want. Think about what you want to achieve from your photoshoot, whether that may be attracting customers as a personal trainer, increasing sales as a clothing brand or simply getting some shots to show off your physique. Think about what you are trying to achieve with each photo individually and how these shots will work together. For example, you might want a to get a nice range of shots to show off your physique so you may plan to do some front shots, side shots, head shots, back shots and then get more creative when you have the basics sorted! Use your shot list on the day and tick off each shot you want as you go. This professional approach means that you will get everything you wanted, as it can be easy to forget what shots you planned during a hectic photoshoot. Diet is especially important before a photoshoot, so much so that a whole article could be written on the subject. However, here are some key tips for the week before the shoot that should help you look your best. If you have been cutting prior to the photoshoot, begin to ramp up your calories back towards maintenance in the weeks running up to the shoot. Carb loading can also be used to make sure you look bigger and more muscular. This can be achieved by either front loading (eating a large amount of carbohydrates at the beginning of the week and reducing this in the days up to the shoot) or back loading (slowly increasing your carb intake daily in the week before the shoot) – we have used both with great results. You can experiment with water depletion, but this can be risky. Not only is it unhealthy, but if you get it wrong you can look far worse than if you just followed your regular diet. We have experimented with a mild approach which had good effects. This involved increasing water intake over the week prior to the shoot, reducing it on the day before, and then sipping water only when thirsty during the shoot. Do not make any huge changes to your diet, as it is far more likely to have a negative outcome than a positive one. Your body may be shocked by sudden changes, and may make you look worse as a result. In terms of diet, try to consume some low-fibre carbs a couple of hours before the shoot is due to start. This will make you look full and muscular without bloating. Half a small pizza eaten two hours before the shoot should do the trick. Many also recommend a 6-inch turkey sub sandwich. A candy bar or sugary snack 10-15 minutes before has also been recommended by many bodybuilding competitors, as this will keep you energetic, keep your muscles full and fend off hunger whilst keeping you from bloating – try a Snickers or Reeses Peanut Butter Cup. If the shoot is all day, then you will want to keep yourself from going hungry without ending up getting bloated. 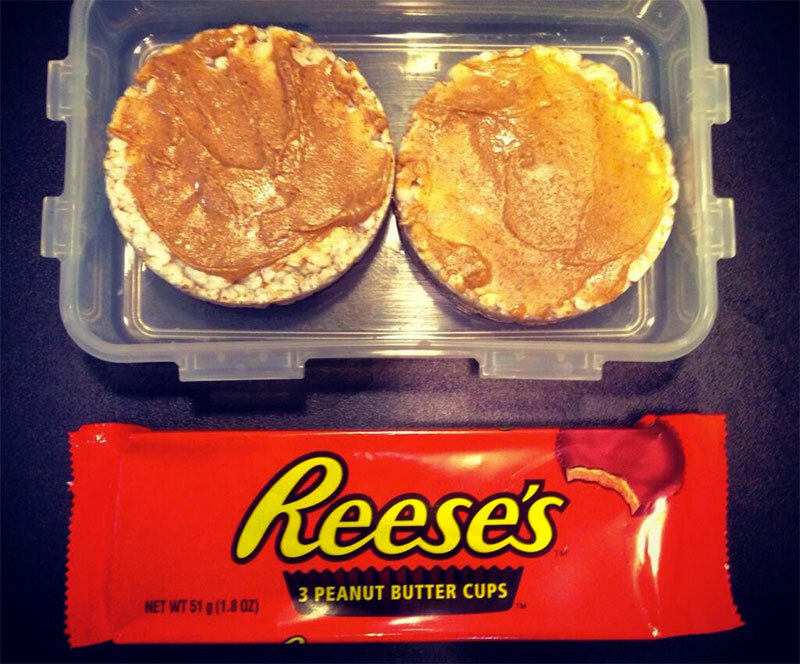 Rice cakes with peanut butter are a great low-volume snack that will help you stay energetic whilst looking your best. If you’re doing a fitness photoshoot, then pumping up should be a no-brainer. It might seem contrived, but getting a good pump in your muscles before and during the shoot can transform your body from looking small and soft to muscular and defined. Bodyweight exercises can be useful, but bring along a small 5kg (10lb) pair of dumbbells if possible to make sure you can work all muscle groups. Stick to high reps (15-30 reps), take short rests and get a good burn in your muscles. Keep the weight light to ensure you don’t injure or exhaust yourself and don’t train so hard that you get really sweaty, as this can ruin your grooming unless that is the look you are going for. Make sure you are well-groomed. Plan every photo and know its purpose. Do not make any drastic changes to your diet in the last week. On the day, avoid getting bloated by skipping on fibrous foods and not eating too much. Pump up to get your body looking its best.